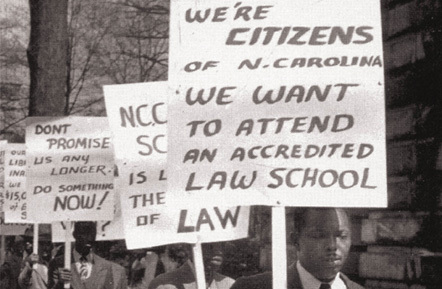 North Carolina Central University School of Law, which began operation in 1940, struggled to keep its doors open in the early years as it battled low enrollment, external pressure to close the school, and insufficient financial resources. By 1949 it could barely make ends meet. When students failed to raise the support of officials by touring the state, they turned to picketing the State Capitol in Raleigh. In 1950 the school was accredited by the American Bar Association (ABA), and today it is one of six historically black ABA-accredited law schools in the nation.